Appranix received the EMA Top 3 award for enabling enterprises to release faster, cheaper, and at higher quality across different data center and cloud infrastructure types. The Appranix platform provides IT operators full insight into current and future release requirements, changing configuration parameters, and health metrics. 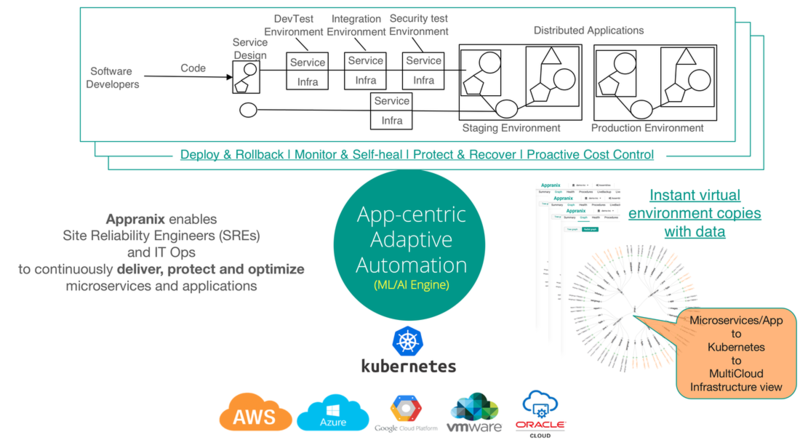 We invented the term "DevOps OS" to describe Appranix, as the platform goes one step beyond managing applications and looks at individual releases and environments. Availability, performance, security, data locality, and scalability are critical policy components for any application. Appranix enables developers and operators to control and monitor these elements in a purely application-centric manner, independent on whether the application is hosted in VMs or containers in the data center or the public cloud. This enables consistent policy management for legacy apps and for modern cloud native applications. The Appranix platform offers full insights into all relevant details of upcoming releases, by showing developers and administrators configuration data, health metrics, event logs, and code changes between releases. Appranix also ties together Dev, Test, Staging, and Live environments to ensure absolute congruence. As Appranix tracks the “delta” between releases, the software enables instant rollback, no matter whether the application runs on VMs or containers. IT operators are familiar with the announced introduction of new technologies by the development team, while developers are familiar with operators blocking new releases due to new technologies (libraries, databases, cloud services) being introduced without warning. Appranix flags all of these new components from the first test build and assigns a price tag for the infrastructure cost of all release components. Instant audit readiness is a dream for most. Therefore, we are excited about Appranix LiveComply continuously tracking changes to development, test, and production environments to ensure ongoing compliance across clouds and container technologies. The Appranix AI continuously optimizes application and infrastructure parameters to minimize infrastructure cost by optimally leveraging cloud-specific resources, while still ensuring policy compliance. This enables users to get the most from their cloud deployment, without continuously investing time in staying up to date on the ins and outs of pricing models.